I attended the Winter Quilt Show in West Bend today. I went with my friend, Sue and we took our husbands along as well. We have such supportive husbands that they didn't mind tagging along and I thought the guys could keep each other company while Sue and I did some shopping. There was also an added incentive; we were going to a brew pub in West Bend right after we left the quilt show. I love this quilt show. It's not extremely large but large enough to have a nice variety of vendors available to shop. Last year I found a booth where they offered an incredible price on fat quarters if you purchased more than 20. It was the best deal there. This year that same booth had the 20 fat quarter deal but the price had gone up to the point where it wasn't such a great deal. That did not stop me from purchasing some fat quarters but I was not going to buy 20 of them. I also found other good deals on fabric which makes the 45 minute trip here worth while. The quilts on display were amazing as always. Since I started to do more free-motion quilting with my new machine, I was more interested in the quilting then the piecing this year. Having Sue with me to share points of view with was wonderful. Hanging out with another quilter is always fun at a quilt show. We also ran into some of our Quilts for Kids sewing friends there which was nice. In our hustle to get in the door where it was very crowded made us realize that we never filled in our door prize forms. So we didn't stop to enter into the drawings until they gave away two sets of prizes. As crazy as that was, I happened to win when they had their third drawing of the day. And I won a very nice prize; it's a Frivols kit from Moda. The prize was donated by a shop called Holly & Ivy which is in Ripon, WI and I made sure to stop by their booth to thank them personally for the lovely prize. It was a great day at the show and a wonderful afternoon of laughing and hanging out with our men over at Riverside Brewery and Restaurant over on Main Street in West Bend. I've been keeping my batting scraps for a year or two now. I don't what possessed me to start hoarding them, but I did. They make the nicest stuffing for large floor pillows and I guess I thought that since I have so many jeans to repurpose that someday I would put the two together. Apparently today is that day. As I sat sorting through my fabrics, I came across a few pairs of jeans that needed to be cut up into pieces. So I took out my jeans bin and started cutting then sorting. I was inspired to make a few new floor pillows just from going through that process. I decided to make a floor pillow with the seams exposed to give it the rag quilt look. I had so many larger pieces left when that was completed that I sewed them together using some decorative stitches to make a second floor pillow. With this second one I chose to do some stitching around the edge to make a nice finished look as well. There were enough batting scraps to fill both of these large floor pillows. I did take the time to cut the long batting scraps into small pieces so the pillows will get a nicer contour. Once I had them completed, I felt very resourceful. I think the larger one will make a nice dog bed and the smaller one will look great once the seams are more frayed for that raggy look. Now I have two empty white plastic storage bins. I bet they won't stay empty for very long. I was asked to make 30 of these baskets in less than a week. It was an impossible request since I had 4 days worth of commitments at the time of the request. I could agree to make 10 though. The deadline for delivery is today and I finished them last evening. Talk about getting something done in the nick of time! I really like making these charming little baskets and I personally have a few around my sewing room. They hold a lot of little odds and ends which makes them practical. They are definitely one of my best sellers. My friend, Anna made these crocheted dishcloths for me. She decided to learn how to crochet a month ago and she seems to have mastered the skill so very quickly. She showed me her stack of about 15 dishcloths that she had made. There were bright ones, fancy ones, simple ones and some complicated ones. They were all amazing. She told me to pick some out so I chose a solid colored one and a fancier one. I am in love with her work. I wish I would have taken a photo of all of them just to look at how great she is at making these. Due to the chilly, snowy conditions here our Quilts for Kids meeting for today was cancelled. I was really disappointed. After spending the last few days at home, I was getting a case of cabin fever and looking forward to joining the outside world for a few hours. I thought I might as well make the best of it and finish my current QfK project as if I was at the meeting. Once I had the quilt finished, I wanted to photograph it outside and as you can tell from the outcome, it wasn't easy. The snow was coming down sideways making it impossible to lay the quilt out flat. Every wind gust flipped the edges so that the back was showing. I finally decided that since the QfK label appeared in the photo it seemed like an appropriate shot to post. The temperature this week has been hovering around zero. That makes it a good week to stay indoors and hang out in my sewing room. Since I have a few client projects that needed to be finished, now seems like a great time to get them done. 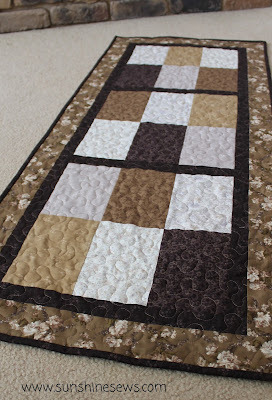 I machine-quilted a baby quilt yesterday and worked on quilting three table runners today. It felt great to get these all finished and ready for delivery. I would love to show them off but I didn't ask for permission to show these off so I photographed them in their 'ready for delivery' state. I helped a friend finish her quilt this week. She finished her quilt top and made the backing then offered me the chance to practice my free-motion quilting skills by quilting it for her. So I bought some batting and matching thread and prepped the layers for the machine. I really like the pattern she used and I think I might have to use the same one for a future project. She said it went together easily which is always a nice thing. Since the backing has a swirly design, I decided to stitch swirls in the quilting. I am always so nervous when working on someone else's project. 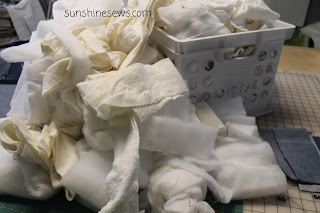 I especially worry that there might be a few puckers in the back of the quilt but I discovered I can help alleviate that by pinning, pinning and more pinning. Once I was done, there were no puckers! Yay! I completed this table runner using a pattern from Dragonfly Fiberart called "You've Been Framed". The pattern requires the purchase of 6 fat quarters to make the blocks and there's enough left over to make an extra table runner. 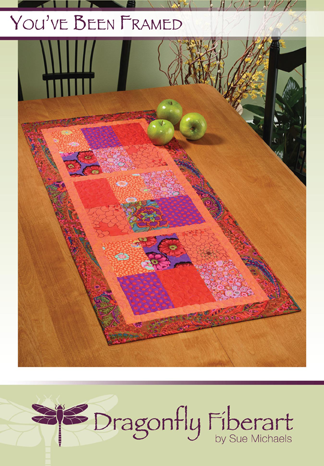 I made the original table runner for the quilt shop and it is on display to help promote a class where this table runner will be made; there are also table runner kits available at the shop using the selected fabrics from the sample. It was a very simple runner to make. I only took me about an hour to cut the rectangles and sew the blocks together. I added the sashing and borders then starched and pressed the finished top well. I used Warm N' Natural batting then pressed the backing. I pinned the layers together and then I chose to free-motion quilt it using an all-over meander. I trimmed it up then made the binding. The entire process was completed in about half a day. After that, all that was left to do was to pin then sew on the binding. I sewed the binding to the front of the table runner then I waited until my husband came home from physical therapy. Those sessions make him sore so he likes to relax in front of the television to rest. That was a great time to hand-stitch the binding to the back of the runner. So happy to have this finished. Even though it is not really my style, it is very pretty. When I'm not using my ironing station, I put a table topper on it. Today I threw some floor pillows up there that I made from old blue jeans. They were taking up too much space on the sewing room floor. It seems that my kitty, Ruxin decided to hang out there while I was sewing. I love that he stays with me in my sewing room. Usually he is "helping" me by sitting on the cutting table while I'm trying to measure and cut fabric. Or he sits on the quilts when I am free motion quilting. I do shut the door to keep him out when I'm working on client projects and he sits outside the door and verbally lets me know how unhappy he is that he cannot come in. He's our little 4-year old rescue kitty that we got in October and it seems he is getting used to being with us. I sure hope he likes it here because this is his forever home whether he likes it or not. 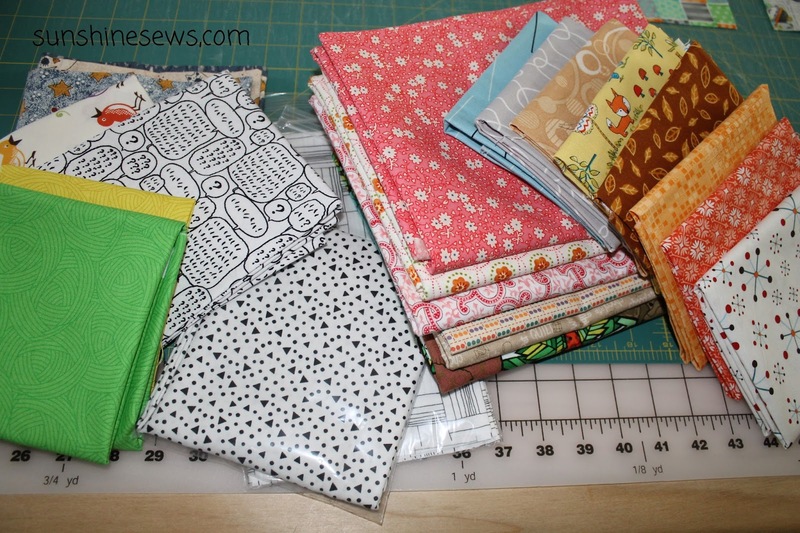 I am so happy that I finished 5 quilts in the month of January; my UFO pile has dwindled down to a tiny pile. I decided that since most of the unfinished projects I have left now are small ones, I would try to put them up on the design wall as a reminder to finish those as well. The problem I am having is momentum. In January I was all charged up to be successful in completing my new year's resolution but now I'm starting to feel a little worn down by it. I think I will still get more done, but some other things are getting in the way that are slowing me down. The first obstacle is that I have to make a table runner for the shop. I've completed the top now I just have to quilt it. It is in some pretty browns and tans and the cool thing is that there is enough fabric left over from the fat quarters required that I can get two table runners out of it. They are also on the design board to the right of my UFOs. I also have 2 small client projects to complete. I will definitely finish these things first, so maybe that will help me gain some momentum to get back to the UFO pile. 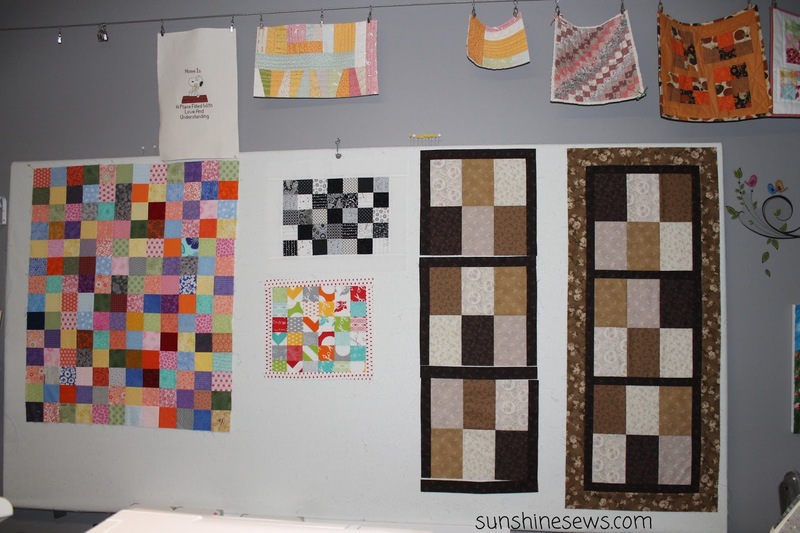 The patchwork on the left side of the design board will become a tote bag. The pattern is very cute and the bag requires grommets. I think that's why I never finished it; I find grommets intimidating. Maybe I can get my husband to put them in for me. The other two things on the design wall will become table toppers that I will use on the shelves of my ironing station. Those will be easy to complete. Hopefully by the end of February I can post a new project on my design board and totally call my new year's resolution complete!